Recently, I’ve been transferring my FCP X projects to Adobe Audition for a final audio mix, then importing them back into Final Cut for final output. I’ve discovered there are a few traps along the way, so this week, I decided to share my workflow so you can use it to improve the audio of your projects as well. Final Cut is excellent for editing, but there are still difficulties in creating a good audio mix or repairing problem audio. Audition excels in both these areas. Here’s a recent edit of one of my weekly webinars. I present two shows each week, then edit the best portions of each to be posted to my store and Video Training Library. This also gives me a chance to clean up that which needs to be cleaned up. Each edited webinar runs a little less than an hour. Once the project is ready to mix, which means the edit is complete and all shots are “locked,” select the project in the Browser. 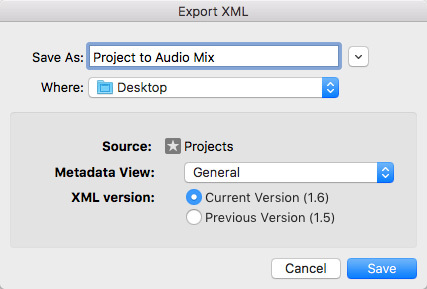 With the project selected, choose File > Export XML. In the Export XML dialog, all the default settings are fine. Make sure to always pick the highest version of XML for the export. Give the project a name and storage location. Notice that I’m storing the XML file to the Desktop. This is intentional. I don’t archive XML files. When the edit is done, I delete the files. If you want to archive the XML file with the rest of your project files, then be sure to store the file somewhere safe. HOWEVER: The ONLY way to move projects between different applications is via XML files. This is true for FCP 7, FCP X and all versions of Premiere. Archiving XML versions of finished projects is a good way to assure you can open them again in the future, should you need to do that in a different application. Once the XML file is exported, we are done with FCP X for a bit. Adobe software, meaning Premiere and Audition, supports a different flavor of XML than Final Cut Pro X. So, the XML file you exported from Final Cut needs to be converted before you can import it into Audition. To convert the file, drag the XML file either on top of the XtoCC icon in the dock or the Applications folder. The utility will ask which Roles you want to convert. Because we only need the audio files, click None for all the video Roles on the left. Be sure all the Roles on the right are checked, which is the default setting. This dialog also means that if you only wanted to process the dialog, for example, you would only need to check the Dialogue Role. Next, you have the opportunity to rename the file. 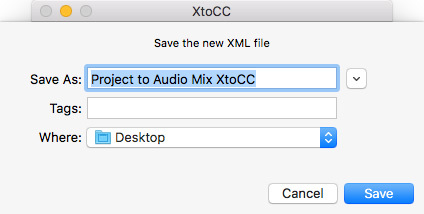 I generally just go with the default, which adds “XtoCC” at the end of the file name. In just a few seconds, a second XML file shows up on the desktop. Open Audition and choose File > Import > File. Choose the converted XML file (the one ending in “XtoCC”) and click Open. 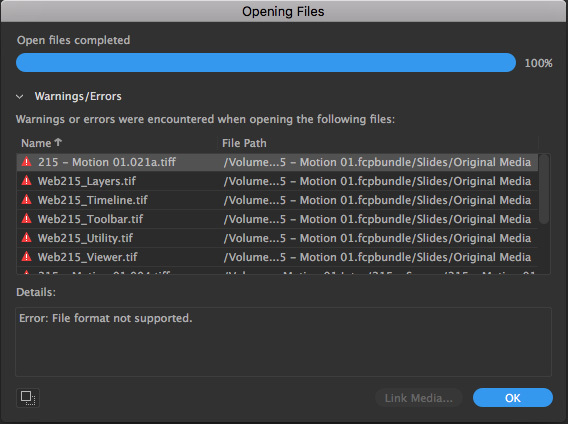 A dialog appears listing “Missing Files.” Since Audition is an audio-editing application, it ignores all image and video files in a project except the first one. Click OK to accept this dialog. The mix opens in Audition and, initially, it can be overwhelming. Audition assigns each audio channel in a clip to its own track, and, for stereo clips the left and right channel each get their own track. So, a 2-channel stereo clip is split across four channels in the Timeline. This may seem awkward, but provides the greatest amount of panning control for every element in your mix. After the file opens, you’ll generally need to relink files. If so, select any clip in the Timeline and choose Clip > Link All Media. Navigate to where that missing clip is located and click OK. As long as file paths haven’t changed, Audition will automatically find all remaining unlinked media. IMPORTANT NOTE: I store all media externally for anything I expect to create an audio mix for, because we can’t link to media stored inside a Library. Once relinking and waveform generation is complete, its time to mix your project. …. [ Time Passes ] …. When the audio mix is complete, it is time to export a WAV file for Final Cut. Since Final Cut supports stereo or surround audio for final export, but not mono, I always create a stereo WAV file; though AIF would work just as well. 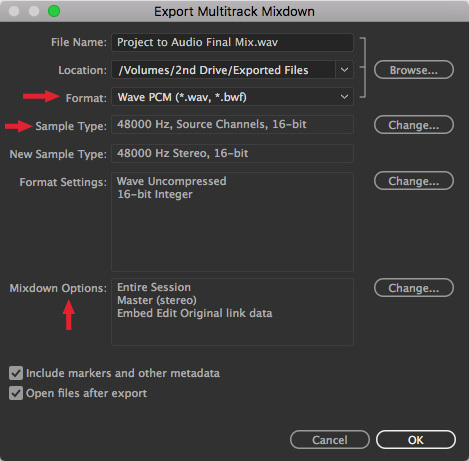 Choose File > Export > Multitrack Mixdown > Entire Session. WAV or AIF are equally high quality audio formats, you can choose either one. Don’t use any other setting, you’ll potentially damage the audio quality. This dialog also gives you the option to change the file name, which I did in this example, and pick a location to save the file. 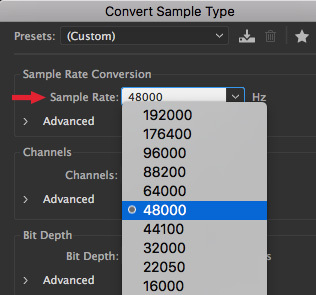 Make sure the Sample Rate is set to 48000, which is the default for all video editing software. 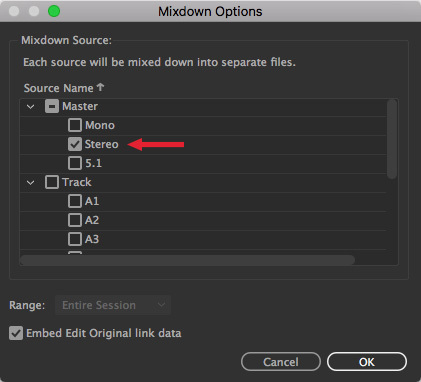 Make sure Mixdown Options are set to Stereo. Audition should set the export options to match the project settings FCP was using, but, in case it doesn’t, you’ll need to change these checkboxes. At this point, you are done with Audition. Save your work and quit the application. NOTE: A stereo file, with 16-bit depth and 48,000 sample rate, will take about 650 MB to store. Importing the final mix into Final Cut is the same as importing any other clip: File > Import Media. Next, open the project into the Timeline and edit the final mix into it. Be SURE to align the start of the audio clip with the precise beginning of the project, otherwise, you’ll lose audio sync with the video. In this screen shot, the audio mix is the stand-alone clip at the bottom. In the past, we would need to mute entire tracks, or each individual clip, to make sure we hear only the final mix. Now, Roles make this much easier. 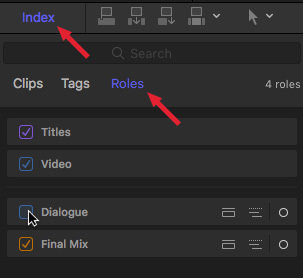 Choose Modify > Edit Roles and click the Plus icon for Audio Roles. This creates a new Role. Name the new Role whatever you want, but I use “Final Mix”. Then, click Apply to close this dialog. NOTE: The -1 connotes a subRole. Choosing the first listed subRole is fine. To test to make sure everything looks and sounds great, open the Timeline Index (click Index). Click the Roles tab. Uncheck all audio roles except for Final Mix. This allows you to watch all video and titles, but only hear the audio of the Final Mix. If everything sounds good, its time to export the final project. Select the project you want to export and choose File > Share > Master file. This creates a high-quality master file which you can then distribute or compress as a second step. NOTE: You can’t use Roles when exporting compressed files. 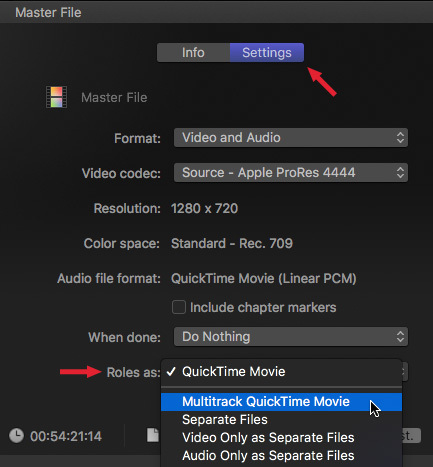 In the Master File window, click the Settings tab, and change the Roles setting to Multitrack QuickTime Movie. Then, click the Minus icon to remove all audio Roles EXCEPT the one for the Final Mix. Here, for example, I am outputting all video and all titles and ONLY those audio clips assigned the Final Mix role. Also, notice this is exporting as a Stereo file, which matches what I exported from Audition. When you click Next you have the opportunity to name the final movie and assign a storage location. This sounds like a lot of steps, but it doesn’t take a lot of time. If you exclude the time needed to edit the original project and create the audio mix, the process of moving files between the two apps takes about two minutes to move from FCP to Audition, one minute to import the final mix back into FCP X and, maybe, two minutes to start the final export out of Final Cut. In other words, virtually no time at all; while the benefits of using Final Cut for video editing and Audition for audio mixing far outweigh the time involved. 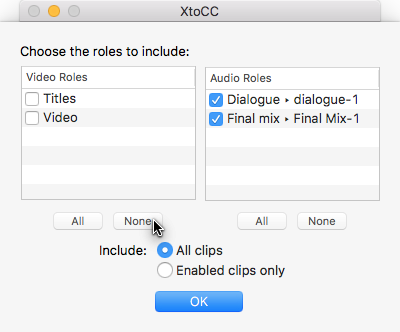 One feature I would like to see in either XtoCC or Audition is the ability to delete any audio keyframes and volume settings made in Final Cut, when a file is imported into Audition. Currently, all these levels need to be reset manually by clip. I’ve shared my thoughts with both Adobe and Intelligent Assistance; I’m hoping this turns into an option in a future version of either program. I have always wondered why either FCPX or Audition do not themselves offer this conversion and keep it updated so it works smoothly with application upgrades of the two programs. Any thoughts? Thanks for great training, as always. That’s a questions you’d need to ask Apple or Adobe. Couldn’t you just export a multitrack stems only of your audio from FCP X and import them into Audition, mix and then export the final mix? when you export the XML you are getting individual clips with handles. The multitrack stems would be a single clip with no handles. Individual clips allows us to clean up hum or noise in one clip that doesn’t exist in others. 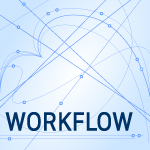 XML creates a more flexible opportunity for editing. For very simple audio this may be okay, but for audio with four dialog tracks, ten effects tracks, and four more music tracks — this method would create a mix in Audition of 36 tracks. 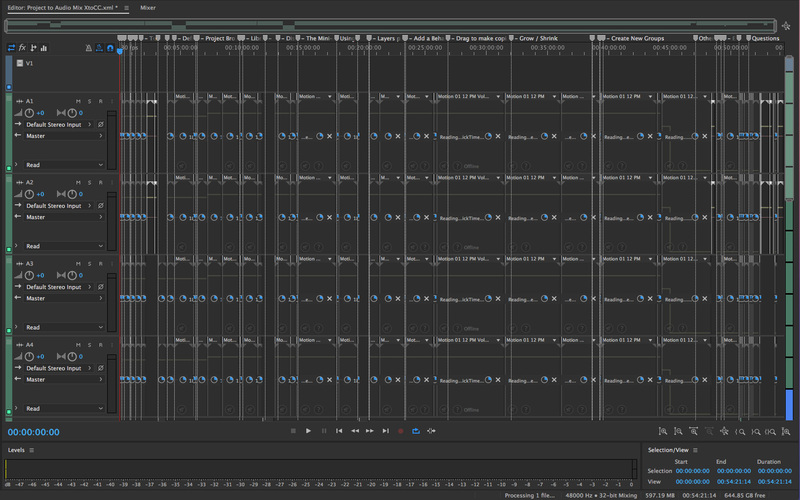 Doing minute volume keyframe adjustments when having to adjust each of these channel tracks separately is a nightmare. BTW, I would love a Soundtrack Pro X version that is as easy, powerful, and wonderful to use as Audition that has the native Mac features of Final Cut Pro X! I totally agree and have been pestering Apple for this for the last several years. Audition now supports stereo tracks. 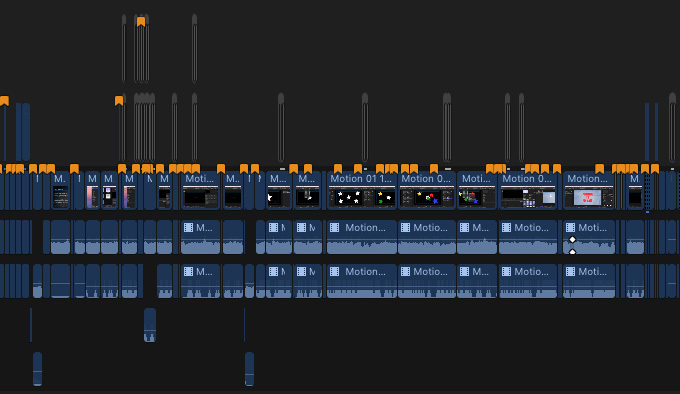 So, just as you have 18 layers in FCP X, you would have 18 tracks in Audition. Making control easier in Audition is creating submix bus – one each for dialog, effects and music. This provides master gain control, allowing you to add common effects, while still providing the ability tweak each individual clip as necessary.